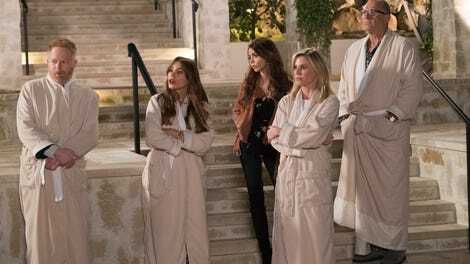 For the most part, Modern Family has two approaches to its episodes: there’s either a dominant A story complemented by a few meaningless B stories, or one large, overarching plot that includes every single person in the main cast. Both kinds of episodes have their charms. The former allows for a more focused, personal approach to certain storylines, while the latter indulges in chaotic comedic timing and complex plotting. More often than not though, especially in these later seasons, the complex, chaotic storytelling of the latter can’t be sustained. Everything goes off the rails, and the jokes don’t land because there’s just too much going on. This week’s episode, “Wine Weekend,” is the rare episode that manages to intertwine everything into something coherent and funny. This week’s excuse for getting the whole family together—sorry Alex, you’re not included and your absence isn’t explained, thought Luke is presumable working—involves Haley allowing her family to stay in her boss’ mansion while taking in a weekend of wine tasting. The house comes complete with personalized robes that exfoliate the skin, and a door that boasts the sweet sounds of “traditional Tibetan creaking hinges.” Haley’s boss, who’s made a career out of lifestyle blogging and unearned confidence, only has one rule: nobody touches the tiara in the drawing room. From this setup Modern Family spins a number of different stories, splitting the cast up into various pairs while using the tiara as Chekhov’s gun. Initially, the episode looks like it’s going to be a dud, populated by the usual stories of the spouses getting sick of each other. Claire complains about Phil’s horrendous bear slippers, Jay just wants to get Gloria drunk so that he can take care of Stella, who he’s secretly stashed at the Ritz down the road, and Mitchell is quick to remove himself from Cam when the promise of a party at Oprah’s house presents itself. Usually those kind of episodic plots devolve into unnecessary cruelty and stale jokes pretty quickly, so it’s a relief to see “Wine Weekend” pivot into something much more satisfying. By the end of the episode not only does the episode turn the tiara payoff into something unexpected, it also manages to craft something that largely holds together despite all of the moving pieces. This is, without a doubt, a crowded episode. There’s a lot to take in. From the fact that Phil Cam, Mitchell, and Claire are now taking hip hop dance classes to Manny’s apparently abysmal performance in a play, “Wine Weekend” demands a lot of patience in its setup. The scenes are laid out in rapid succession, and it’s a little disorienting. But once every single storyline gets rolling, Modern Family finds its groove. Cam and Phil break away to practice their dance routine after learning that they’re slotted for an audition for the Tuesday Company, which apparently elevates them above the rest of the class. Jay does his best to take care of Stella while Claire looks to get rid of another one of Phil’s prized but ugly possessions while on vacation, and Gloria and Mitchell attend a party at Oprah’s because it’s impossible to turn down such an opportunity. The way each separate plot plays out varies in its quality. 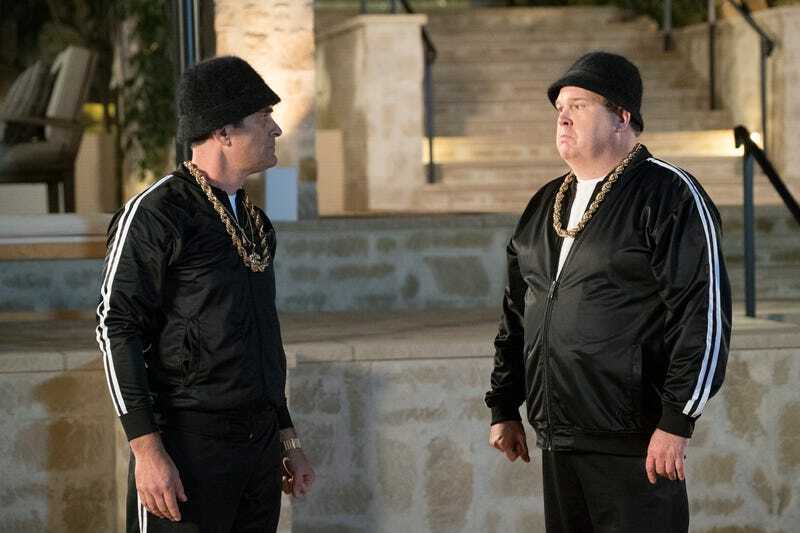 Cam and Phil’s story relies too heavily on “white folks use black slang” as a gag, but there’s no denying that Eric Stonestreet and Ty Burrell are a dynamic pair. They carry the predictable, rote storyline, and their genuine joy at pursuing something creative and fulfilling acts as an emotional anchor to all the ridiculousness. Mitchell and Gloria also make a good pair. They share a joy similar to Phil and Cam’s, but it comes from brushing up against celebrities and stealing Oprah’s candy dish. It’s less pure, but it’s in line with who they are. Jay and Claire, on the other hand, are mostly obnoxious. It’s kind of their thing. Their storyline is the only one that doesn’t really connect or contain any truly funny moments. The idea that Claire is kind of mean to Phil and that Jay loves Stella in a way that borders on being obsessive is hardly new territory. There’s nothing wrong with flawed characters in a sitcom, but too often Jay and Claire are downright insufferable, to the point where their screen time is a drag. Thankfully, “Wine Weekend” isn’t defined by Jay and Claire. Rather, the episode uses each story to weave a comedic tale of secrets kept and desires hidden. The episode’s climax, where everyone is forced to disrobe after Manny and Haley find the tiara cracked, is the kind of culminating scene with manic energy that this show just doesn’t pull off all that often anymore. Every storyline builds to this moment, as Phil and Cam’s ambitions are revealed, and Mitchell and Gloria are exposed as the fame-chasers they are. It’s a fitting climax to an episode that balances all of its plots admirably. Add in Haley’s reveal that she broke the tiara the night before, and “Wine Weekend” becomes a low stakes episode that manages to hit its mark. Manny is the most unlikable character on this show, yes? Please weigh in, this is very important. I originally chalked up Alex’s absence to college, but Manny is there, so who knows. Nine seasons in and I still don’t recognize Ronaldo, Pepper’s husband, when he appears on screen. Solid episode tag this week, with the Michelle Obama joke paying off.